Wizards came, Wizards saw, and Wizards left the format untouched. The March 23 B&R Announcement is in, with no changes made to Modern. No bans, no unbans, and now almost four months until we start the whole circus over again. Wizards always likes to remind us that Modern is a diverse format, and this current metagame is a testament to that. No single deck has over a 15% share (the historical cutoff point where decks get in ban trouble, e.g. Delver, Pod, BGx Midrange, etc.). Although Abzan is creeping up there at 13.9% as of March 23, that’s still well below the scary PT Fate Reforged and GP Vancouver numbers we saw earlier this season, when Abzan was at 20-25% of the metagame. Looking past deck shares, there is a fairly even distribution of archetypes within the top decks. Twin and Scapeshift give us combo-control. Burn, Infect, Affinity, and Merfolk represent aggro. Abzan holds the format down as the police midrange deck, and RG Tron gives you a ramp-combo option. We’ve even seen Abzan Liege, a new deck following the last ban cycle, gain a secure metagame footing. Although traditional control is still lagging far behind these other decks, and there’s a somewhat worrisome level of aggro, the format is overall quite stable, and the March 23 banlist update reflects that. Since the January 19 bannings, we have seen only two major Modern events (PT FRF and GP Van) and one semi-major Modern event (SCG Open Baltimore). That’s not nearly enough data points for Wizards to act on. But June alone will double the number of data points, with Modern GPs in Charlotte (June 13-14), Copenhagen (June 20-21), and Singapore (June 27-28). These events, representing the North American, European, and East Asian Modern scenes, will be more than enough data for Wizards to make decisions on. But until we get these big events, we just don’t have enough tournaments to look at. We already knew no decks were violating metagame cutoffs (that thin-red-line at 15%), but some decks looked like they might be too fast. Looking at you Amulet Bloom and Infect! Amulet Bloom in particular turned heads at both PT FRF and GP Van, with lots of turn 3 (or earlier) wins on camera, some commanding finishes, great conversion rates, and strong win percentages. But this deck never really reached “top-tier” status; it currently sits at only 2.7% of the entire metagame. This made cards like Amulet of Vigor, Summer Bloom, and Primeval Titan safe from bans. It was also possible Infect would have come under fire, especially with Become Immense adding to its turn 2-3 kill potential. Although Infect has a larger metagame share than Amulet at 6.3%, it hasn’t had the same T8 finishes as Amulet, and has still fit comfortably into the metagame. I have no idea if Wizards and I are on the same page with all these reasons. But based on the data, the decks, and all the articles and opinions out there, I’d guess that this is more or less what Wizards talked about when deciding if Modern needed any changes. As an added important reason, the January 19 shakeup was huge, and I didn’t think Wizards was likely to do something too crazy just a few months after banning three format staples. The next announcement is scheduled for July 13. The format probably won’t change too much in that time, but we will have added three major GPs to our dataset, along with another 3-4 months of finishes from smaller events and MTGO. This will probably be enough for Wizards to make changes. So with that in mind, here are some bans and unbans to watch out for. It’s a sad state of affairs that Modern B&R announcements are often a time for worry and anxiety instead of excitement. But given that Wizards has banned almost a dozen cards since the format’s debut at PT Philly, and unbanned less than half that many in the same time, I understand where this is coming from. 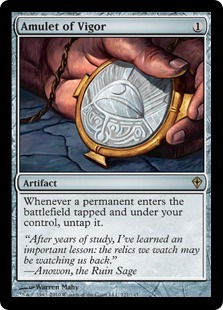 Looking ahead to July 13, there are a few cards that I believe are on the Wizards watchlist. Of course, if you ask the average Modern player, every card in the format is probably on that watchlist. Fetchlands? Check. Abrupt Decay? Check. Tarmogoyf? Double check (just ignore the MM2 reprinting). And that doesn’t even count all of the cards that are both more reasonable for ban discussion (e.g. 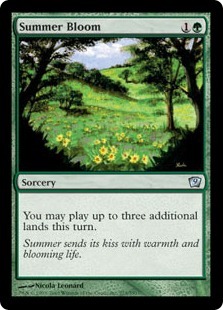 Summer Bloom) and wildly unreasonable (e.g Manamorphose, Gitaxian Probe, etc.). Trying to balance ban mania against realistic predictions, here are the three cards R&D are probably giving a little/lot of scrutiny in the next months. Will we ever forgive Bloom for those on-camera wins and its early 2015 performances? Honestly, probably not. This is exactly the kind of non-interactive, fast, resilient, and overall powerful combo deck that Wizards doesn’t seem to like too much in Modern. I’d bet my Amulets and Titans that the only reason this deck avoided a March 23, 2015 banning is because it just wasn’t seeing enough play. When a deck’s overall metagame percentage is just 2.7%, and its traditionally strong MTGO prevalence is only 3.4%, you can’t call that deck “top-tier” with a straight face. But if this deck keeps getting T8 at tournaments, I can definitely see Wizards expanding its definition of “top-tier” to encompass Amulet. And it’s definitely in trouble if its metagame percentage climbs up. If we still see Amulet with a 2-5% metagame share in July, and with only 0-1 more T8 appearances, it will probably be safe. If that metagame share or T8 rate climbs higher, however, then say goodbye to Bloom. Also, note that Bloom is still the likeliest target for a ban, because it is effectively the Seething Song of the deck and Wizards is unlikely to kill the deck outright with a ban. In another article, I talk about how Infect has one of the highest and the most statistically significant game win percentage on MTGO. When you add to that its PT FRF performance, its continued metagame share at 6-8% of the format, and its raw speed, you have a deck that could be in danger of a ban. We know that Wizards isn’t the biggest fan of super fast decks in Modern. We also know that although Amulet Bloom might not have the metagame share to justify “top-tier” status, Infect is a lot closer. This is a deck that’s just over 7% of the paper metagame, with about 8.2% of the GP/PT/Open day 2 metagame as well. We don’t know if the “top-tier” cutoff is 11%, 10%, or something else entirely, but a 6-7% metagame share has got to be close. If Infect keeps moving up in the world, something might get banned. Become Immense is by far the most obvious choice for three reasons. First, Infect was relatively tame for years, only breaking out into Tier 1 after PT FRF. Although the Delver/Pod bannings probably had something to do with this, the new pump spell was also an “immense” part of that. You need only play against the deck to see it in action. Second, Wizards has already seen how broken delve can be (RIP Cruise and DTT). So it doesn’t take a lot of imagination to see them banning another delve card. Finally, a BI ban definitely wouldn’t kill the deck, and Wizards would probably want to just return Infect to pre-PT FRF levels with a ban. It’s no secret that Twin is a good deck. It won PT FRF and GP Vancouver. It has also been winning these major events for years, with a major event win rate rivaling that of Twin. Twin has also shown remarkable resilience to Abzan, a deck that should theoretically be able to keep Twin in check. Despite the obscene Abzan presence at PT FRF and GP Van, Twin still managed to win those events, even beating Abzan decks in high profile matches on the way to the gold. Couple that with Twin’s metagame shares (9.2% on MTGO, 11.8% in paper, and 14.8% in day 2s), and this looks like a deck that could get a banning. But if Wizards does decide something from Twin needs to go, I doubt it will be Splinter Twin itself. Twin is no Birthing Pod, a card that got better with every set and was the fundamentally problematic part of Pod decks. Moreover, Wizards just killed Pod as a deck and has to realize the consequences of doing the same for Twin; the uproar would be deafening. So how do you weaken Twin without killing it? Say goodbye to Deceive Exarch. With 4 toughness, Exarch is the card that makes Twin most unfair in the format. It’s a deck that should be policed by Modern’s premier removal spell (Bolt), but Exarch doesn’t let that happen. Indeed, we see this in Twin deck lists themselves, which have taken to a 4/2 split between Exarch/Pestermite in recent tournaments. Ban Exarch and Twin has to play much more conservatively against Bolt decks, which itself could make Bolt a more viable card than it is right now. Alternately, Twin has to switch to a white splash for stuff like Village Bell-Ringer, a splash that makes it more vulnerable to aggro and unable to effectively run Blood Moon. As such, the Exarch ban weakens the UR Tempo/All-In versions of the deck without ruining the archetype. There are definitely other cards that could be discussed here and wouldn’t be that unreasonable (Simian Spirit-Guide comes to mind), but I think that these above three are the most likely targets of any bannings. Thankfully (or not thankfully, depending on who you are), the evidence doesn’t justify it now, so we need to revisit this in July. By far the most disappointing aspect of the March 23 announcement was the lack of unbans. With as many #free(insert-card-here) messages as there are cards on the banlist, it’s clear that the community wants at least a few cards added back into circulation. I think a few of these suggestions are reasonable ones, both based on the cards themselves and where the metagame looks to be heading. So when you wake up July 13 ready for the B&R announcement, these are the two unbans I would look for. Speaking of hashtags, #FREESWORDOFTHEMEEK. This is a card that direly needs unbanning in Modern. To start, the Sword/Thopter Foundry goes into the decks that desperately need help right now: control. That includes 4C Control, Esper Control, UB Tezzeret, UB Control, and a host of other traditional, underrepresented control decks that need some Wizards love these days. Ignoring Twin, which is a bit of a stretch to classify as “control”, the archetype makes up less than 5% of Modern, with Scapeshift at about 2.4%, UWR Control at 1.7%, and a variety of random decks bringing up the rear at a collective 2-3%. More importantly, this is not a card that powers up existing tier 1 archetypes. Twin Sword is cute on paper but would be a total mess in practice. Abzan Sword or Affinity Sword sound even dumber. This suggests Sword would have the exact effect people predict, which is to power up control without powering up other top-tier decks as an incidental cost. Finally, Sword directly goes after the huge subset of Modern decks (25-30%) that are playing aggressive strategies. In particular, it gives players a weapon against Burn, a deck that is good but perhaps a tiny bit too good relative to the rest of the format. There aren’t a lot of players who enjoy losing to 6-7 Bolts by turn 4. For all these reasons, Sword seems like a very safe unban for July 13, provided that aggro is still high (likely) and that control is still underrepresented (even more likely). Risky unban alert! Like Sword, AV has a good chance of powering up control decks and giving them a badly needed tool to get them back in the format. In fact, AV is probably more powerful than Sword in that respect, so its effect on control could be even larger than just the Thopter/Sword combo. But unlike Sword, AV can also theoretically go into a deck that is resoundingly tier 1 and maybe make it too good: UR Twin. An AV unban depends entirely on two factors. First, it depends on Wizards’ identification of what is holding control back. If they think aggro is holding control back, then Sword becomes the better unban. But if they think that the efficient BGx decks are holding control back, and/or if those Abzan style decks have a metagame share over 15%, then AV becomes a better unban to keep them in check. But the clear danger here is if AV breaks the Twin decks and Modern spirals into a format where Twin is 20%+ of the metagame on the back of AV. No one wants that, least of all Wizards. This leads to the second factor that will determine an AV unban, which is Twin’s prevalence itself. If we still see a format that is 12% or so UR Twin, AV becomes an unlikely unban. There is no way that R&D wants to risk a Twin takeover with this card. But if we see Twin at a more manageable 8-10%, or if that share is split between different incarnations of Twin (RUG, UR Tempo, Grixis, UWR, etc. ), then that’s another story. In that case, R&D might believe that AV would only power up Twin a little but that any Twin gains might be held back by control deck gains off this card. There are other unbans I could have talked about here, but either because the metagame isn’t quite right for them (e.g. Bloodbraid Elf) or because there are other factors and consideration that need to go into their unbanning (e.g. Jace, the Mind Sculptor). Besides, there are plenty of other unban/ban articles to write on these topics, so stay tuned for more in the future. Until July 13, keep playing Modern, keep hoping for unbans, and keep staying optimistic! Don’t let Cardboard Crack’s best comic of all time get to you… at least, not too much. Seriously, keep up the great work with the site. It’s awesome to have a site dedicated purely to the Modern format and to have a place to keep up with the metagame without having to go look at tournament results. It’s something I check a couple times a day now. More on point, I was actually expecting a Summer Bloom ban at the very least. The fact that it won on T1 on camera, with the opponent unable to respond at all, all but screamed banhammer to me. I guess it’s just not consistent enough to warrant a ban. I do still think WOTC still should have at least removed the possibility of a T1 win in the Modern format though, since we don’t have cards like Force of Will to police stuff like that. I am fellow sotm unban fan, just for funzies sake, what would you think the best deck would be for it? 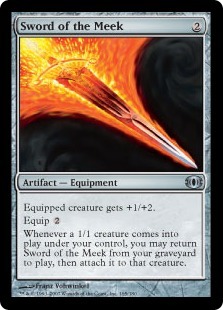 Since thopter depths isn’t a possibility (thank god) I was thinking anything from a Tezzeret shell to a martyr proc shell, which is something that used to pop up in extended. I don’t know how much I would want it in esper sort control as it takes up a lot of space though. I had fun with disciple of the vault alongside it way back when, and obviously this would change with the meta but it is a fun random thought.